Naji Meidani, E. (2019). Sensory Perceptions in Language, Embodiment and Epistemology, Annalisa Baicchi, Rémi Digonnet, & Jodi L. Sandford (Eds.) (2018), Springer, ISBN 978-3-319-91276-9. International Journal of Society, Culture & Language, 7(1), 118-122. Elham Naji Meidani. "Sensory Perceptions in Language, Embodiment and Epistemology, Annalisa Baicchi, Rémi Digonnet, & Jodi L. Sandford (Eds.) (2018), Springer, ISBN 978-3-319-91276-9". 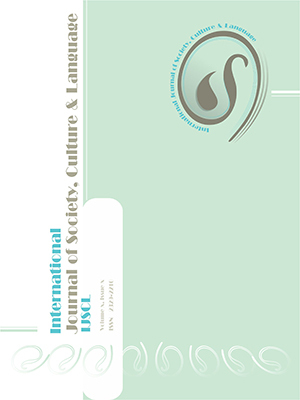 International Journal of Society, Culture & Language, 7, 1, 2019, 118-122. Naji Meidani, E. (2019). 'Sensory Perceptions in Language, Embodiment and Epistemology, Annalisa Baicchi, Rémi Digonnet, & Jodi L. Sandford (Eds.) (2018), Springer, ISBN 978-3-319-91276-9', International Journal of Society, Culture & Language, 7(1), pp. 118-122. Naji Meidani, E. Sensory Perceptions in Language, Embodiment and Epistemology, Annalisa Baicchi, Rémi Digonnet, & Jodi L. Sandford (Eds.) (2018), Springer, ISBN 978-3-319-91276-9. International Journal of Society, Culture & Language, 2019; 7(1): 118-122.